I love Midnattsol - always have since I stumbled upon them a few years back. Their song "Desolation" still brings a bit lump to my throat and the odd tear to my eye to this day. Their sound in their previous two albums was characterized by a thick, bassy, voluptuousness unlike anything else in the Gothic world - with a bit of folkiness thrown in for good measure. Lead vocalist Carmen Espenaes (little sis to Liv Kristine) has a unique tone to her voice for the genre and I have always enjoyed it even though it differs vastly from her sister's. 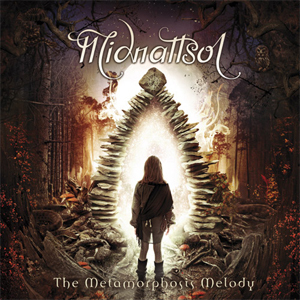 The Metamorphosis Melody marks an evolution in Midnattsol's sound. From the get-go, with the title track, we are treated to a jumpier version of Midnattsol, and as we journey through the CD, the listener hears a lot of symphonic, and, to my ear, progressive, elements. 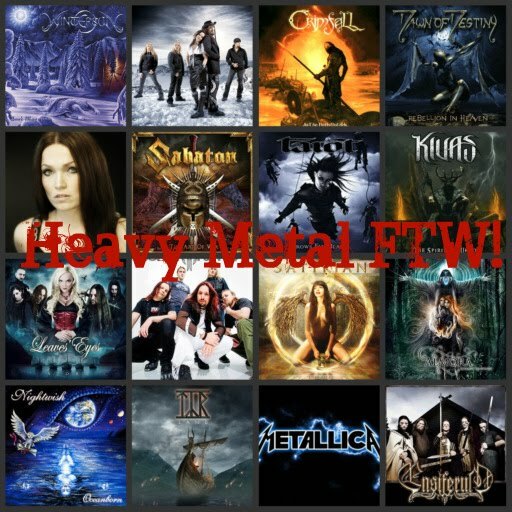 The songs are more complex than in previous offerings, and they are more upbeat and almost power metal-ish in nature. The compositions are terrific and at times pretty frakking rollicking. This is their fastest album yet, and I loved that about it. Lyrically, this is all over the place: there are fantasy themes, environmental themes, and songs about personal development, as well as the typical Gothic-y loneliness/sadness stuff. There are two songs sung in Carmen's native tongue, Norwegian, and there is a bonus track out there that is growled. Standout songs for me are "The Metamorphosis Melody", "Kong Valemons Kamp," "Spellbound" and the acoustic ballad, "Goodbye." There is one glaring issue I have with this album, excellent though I found the music: the mixing is terrible. Specifically, Carmen's voice in all but one song sounds drowned out by the music. Before the hard copy of the CD was available to me and before I got my hands on it, I listened to a download. I thought perhaps I had a bad torrent because I could barely hear Carmen's singing. I also found I needed the lyrics in the booklet, so I was grateful when my copy came so I could read along. In one of the best songs of the album, "Kong Valemons Kamp" - which is awesome - I can barely make out what Carmen is singing. In some songs, she sounds like she's almost whispering. This really detracts from the overall impact of the music and it affected my enjoyment of the album. I think this is such a crying shame because this is a really excellent album and the fact that the vocals are so hard to make out clearly is almost its downfall. Almost. The vocal melodies are absolutely lovely but they lack the oomph they require to give the listener that impact they need to make them shine. This isn't a problem with Carmen's voice at all, make no mistake; she's as great as ever. She's just a little lost in here somewhere. The only song where the vocals weren't an issue in the mix was in the acoustic "Goodbye." I think whoever mixed this CD needs his ears checked. Anyway, apart from that, the album is strong and I hope it launches Midnattsol into something grand!